Also see video: “Netanyahu Wrong on Iraq, Wrong on Iran.” “If you take out Saddam’s Regime, I guarantee you, that it will have enormous positive reverberations on the region. … There is no question whatsoever that Saddam is seeking and is working and is advancing towards the development of nuclear weapons — no question whatsoever,” Netanyahu said on September 12, 2002. 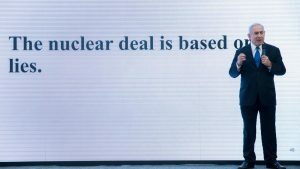 Also see piece by Nima Shirazi documenting Netanyahu’s long record of claiming that Iran is about to have a nuclear weapon. Arms control specialist Joe Cirincione notes: “May I just point out that #Israel had a robust, clandestine nuclear weapons program that it tried and failed to hide for years. They repeatedly and consistently lied to U.S. officials when confronted with the evidence.” U.S. officials themselves typically refuse to acknowledge Israel’s clandestine nuclear weapons program, see piece by Sam Husseini and questioning of then-congressional representative Mike Pence.